Super Adventures is five years old today! Not a huge surprise considering that the site gets a year older at the end of every January, but worth noting I think. Also worth noting is that I've retired the tired worn out rubbish boring old 2015 logo and replaced with it a shiny new 2016 model. Less fire, more curves and pointy bits. This week on Super Adventures I'm having a quick look at the notorious Undertale! I've heard that it's an RPG, probably, but I'm not actually sure. One thing I do know about the game (aside from the fact it's a contender for the 'Lowest Resolution Title Screen on Super Adventures' award), is that it's another one of those Kickstarter success stories. It didn't quite make as much as Wasteland 2 or even Giana Sisters: Twisted Dreams, but bringing in $51,124 wasn't bad at all considering the goal was $5000. You can bet it's made a lot more than that in the five months since release. Everyone says to go into the game blind, so I made a special effort to keep myself utterly unspoiled on it. I've heard the terms 'pacifist route', 'genocide route' and 'skeleton date' being thrown around, but I'm fuzzy on the details. So I'm not just pretending to be clueless for this, I really am clueless. But I can't show the game without showing the game, so I'm sorry if I end up spoiling all the potential jokes and surprises that may (or may not) be at the start. I'm only planning to play the first hour or so though, basically what's covered by the demo I expect, so I with any luck I won't be giving the game away. This week on Super Adventures, I'm finally taking a look at Painkiller, a first person shooter made by Gears of War: Judgment developer Epic Games Poland back when they were still called People Can Fly. Oh hang on, they're back to being People Can Fly again now... and they still have the Bulletstorm license! They'd better be working on making me a sequel right now, I don't care how much the game bombed. 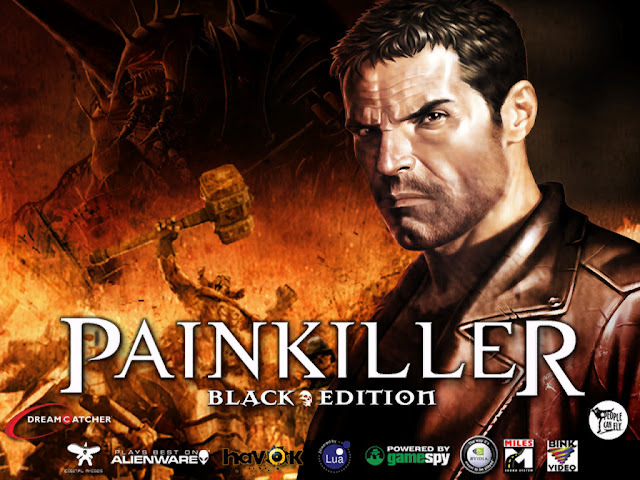 There's about a million different editions of Painkiller and just as many expansions, but as I understand it Black Edition is as close as you can get to the definitive version. It's the original 2004 Painkiller game plus the one expansion developed by People Can Fly, with a 'making of' video thrown in. The game later got a remake/sequel called Painkiller: Hell and Damnation (HD, get it?) but judging by the reviews I've read, seems Black Edition's the one to go for. 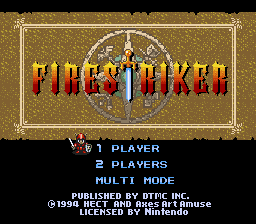 This week on Super Adventures I'm playing SNES game Holy Striker, better known as 'Fire Striker' in the US and 'absolutely nothing' in Europe as they didn't bother to release it here. No great mystery why Nintendo of America decided to tweak the title when they brought it over, seeing how keen they weren't on religious references in their games. That's pretty much the only thing I know about the game, but I've just loaded up its Wikipedia page and apparently it's a "piece of high carbon or alloyed steel from which sparks are struck by the sharp edge of chert or similar rock". Uh... what the hell's chert? Also, is there really no page for the game Fire Striker? Have I finally found something Wikipedia's never heard of? Oh duh, I was just spelling it wrong; it's FireStriker without the space. You know what, forget the wiki page, I'd rather come into it blind anyway. Hang on a second, there's three choices on the title screen and not one of them says 'OPTIONS'! Super Nintendo games are supposed to give me an options screen so I can put my lives count up and stuff. Instead there's a mysterious 'MULTI MODE' option sitting in its place, which is apparently different enough to '2 PLAYERS' to get to appear alongside it. I'll have to remember to try that out later. This week on Super Adventures I'm looking at the second Indiana Jones point and click adventure game, Fate of Atlantis, and wondering why they've put a colour cycling effect on the logo. That didn't happen in the movies... did it? I don't own the films so I can't check. I should make it clear that this is Indiana Jones and the Fate of Atlantis: The Graphic Adventure I'm playing, as like Last Crusade this has a separate Action Game to go along with it. Though unlike Last Crusade this has its own original story, there never was a 'Fate of Atlantis' film, so the Action Game is actually a video game tie-in... to a video game. I'm pretty sure I had a 'Fate of Atlantis' comic book once as well, but it'd take an archaeologist to find the damn thing now. The game came out after Lucasfilm Games were renamed to LucasArts, so I'm hoping I'll get to see an animation of the Gold Guy logo man doing something at the start. This week on Super Adventures, I'm having a quick look at another one of those Lucasfilm/LucasArts adventures. It wasn't really part of my masterplan to play a pair of Sam & Max games in July then follow them up with a pair of Monkey Islands in September, but seeing as that happened I might as well finish the trilogy with a duology of Indiana Joneses. Uh, bit of a spoiler for the next game there, sorry. The difference this time though is that I've never played this and I've got no idea what it's like. I don't even know if it's considered to be any good. But one thing I do know is that its full title is Indiana Jones and the Last Crusade: The Graphic Adventure, as Lucasfilm also developed a multi-platform Last Crusade platformer in the same year called The Action Game and they didn't want gamers to get them confused. That's good responsible labelling, I applaud them. Weirdly another developer called Software Creations went and made a third Last Crusade game a couple of years later, exclusive to the NES. Which means the console got two entirely different Last Crusade action games. Later Indiana Jones' Greatest Adventures and LEGO Indiana Jones: The Original Adventures would revisit the movie as well. Not a whole lot of Kingdom of the Crystal Skull games out there though, you'll be shocked to learn.